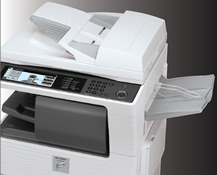 We have a full line of Sharp copiers for sale or lease. Our sales and service team covers Southern California, Inland Empire, Los Angeles County, Orange County, Riverside County, San Bernardino County. 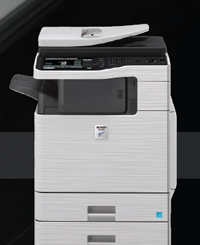 Sharp combines the simplicity and convenience of network printers with the multi-tasking productivity of color MFPs to achieve the best of both worlds. The DX-C310/C311/C400/C401 are exciting examples of the SHARP FRONTIER DX SERIES, bringing brilliant color output closer to your workgroup with a Hybrid design that has a small footprint to fit smaller environments. But these models aren't small on functionality. The informative color navigation screen simplifies operation by providing an intuitive user interface to keep ahead of today's fast-paced office document distribution needs. Sophisticated hybrid design for versatile setup in countertop or floor-standing console configuration, expandable to 4-tray console with a maximum paper capacity of 2,100 sheets. The performance, reliability and versatility large workgroups expect with brilliant high-impact color. 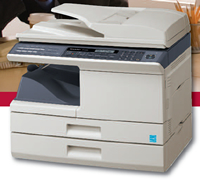 Copy, print, network print, network scan, document filing, Sharpdesk™ and fax option. Copy Speed: 41 to 70 PPM depending on Model. Paper Feed: Standard; 2000-sheet drawer (letter) and two adjustable 500-sheet drawers (letter, legal, ledger, 12"x18", statement size 100-sheet bypass tray. Other trays optional. A full size retractable keyboard to simplify data entry. High-resolution touch-screen color display with graphical menu navigation. With the Sharp MX-B401, the large 8.5" wide color touch-screen simplifies operation by providing an intuitive user interface to keep ahead of today's fast-paced office document distribution needs. 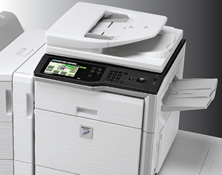 With the MX-2600N and MX-3100N, your business can produce brilliant, high-quality color documents, as well as razor-sharp B&W. Features include 3-position stapling for up to 50 sheets, saddle stitching up to 15 ledger size sheets & hole punching. 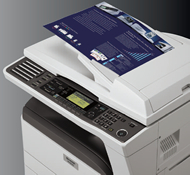 Multifunction desktop IMAGER™ Document Systems with full color PC scanning. 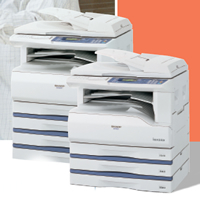 AR-M207E and AR-M162E has out-of-box copy, print, and color scan capablity. 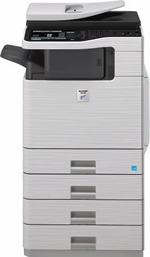 Designed for small offices and workgroups, the AR-208S and AR-208D deliver all the required features for fast-paced, small office environments. 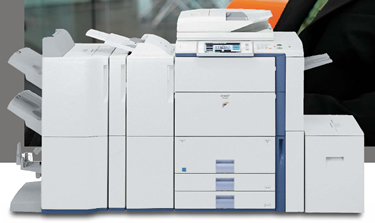 20 page per minute copying/printing and integrated color PC scanning adds workflow productivity.